Tributes have flooded in for the seven-year-old boy killed in a fatal bus collision on Saturday night. The boy has been named as Rowan Fitzgerald, a pupil at St Anthony’s Catholic Primary School in Sydenham. He was travelling on the to of the double decker back to Leamington with his eight-year-old cousin and grandparents when the bus veered off the road and into the supermarket. He died from his injuries and his cousin was rushed to Birmingham Children’s Hospital with cuts to her face, head and leg. She is said to now be in a stable condition. A spokeswoman for St Peter’s Church said: “Rowan Fitzgerald sadly died on Saturday night in Coventry. 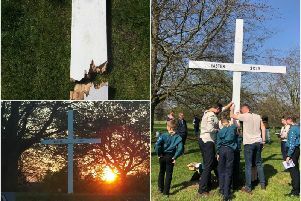 “The church is affiliated with the school he attended and this morning Father Breslin has been there offering his support to the pupils and staff. Messages of sadness and support have also been left on social media as people send out thoughts and good wishes for the families involved. Well-wishers have been leaving flowers, teddy bears and cards at the scene. A pedestrian, Dora Hancox who was in her 70s and from Nuneaton was also killed when the Stagecoach double decker bus crashed at around 6pm. Inspector Paul Bennett from West Midlands Police said: “The families of Rowan and Dora have suffered a devastating loss. “As they struggle to come to terms with their loss, they have chosen at this time not to release any images of their loved ones or to provide any words of tribute. They have also asked for people to respect their privacy as they grieve. The 77-year-old bus driver is helping police with their inquiries. He has not been named by police or Stagecoach, and no arrests have been made. A spokesperson for Stagecoach Midlands said: “Our hearts go out to the families of those who have lost their loved ones. Our thoughts also remain with all those affected by this tragic incident. “No driver we employ is allowed behind the wheel of our buses without us being satisfied that they are fully qualified, safe and meet all necessary legal requirements. “In this case, our driver has many years’ experience and has also passed a mandatory annual medical. “Both our driver and our company are co-operating fully in helping police determine the full circumstances involved. Police are calling on hundreds of potential witnesses to come forward after two people were killed when the bus crashed into the city centre Sainsbury’s on Saturday.